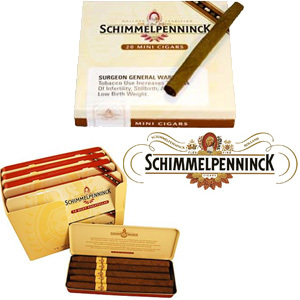 If you enjoy a mild taste, and you want to buy cigarillos, Schimmelpenninck Cigarillos are your new cigar of choice. Featuring a Sumatra sandleaf wrapper and java binder, these Dutch, machine made cigars, combine the best filler tobaccos from Indonesia (Bezuki) and Brazil (Bahia). A popular choice is the Schimmelpenninck Duet Panatella cigars, which feature a noteworthy mild cigar taste. Find out why these Europeon dry-cured cigars are a hit and enjoyed in more than 140 countries, get yourself some Schimmelpenninck Cigars and Cigarillos today.